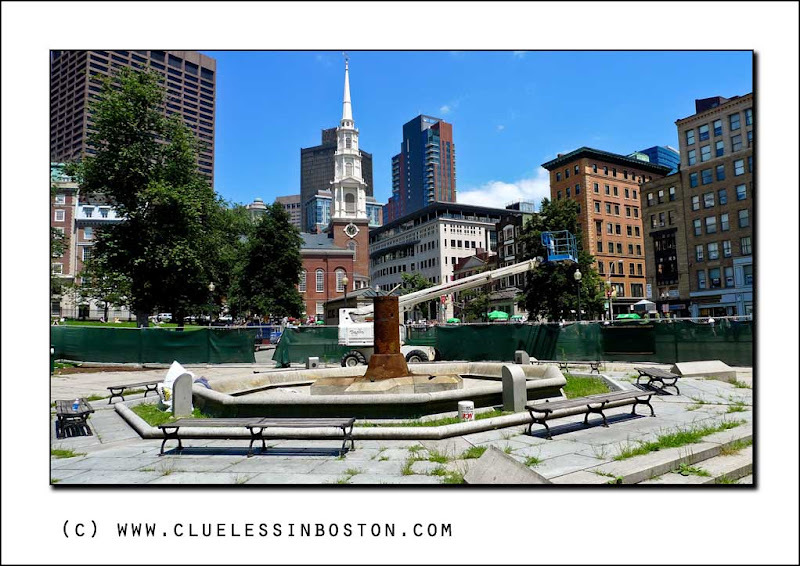 The Brewer fountain in the Common has just been dismantled for repair and renovations. It was last renovated about 30 years ago. I have shown it in parts several times, you can see it here, here, and here. This is a photo of the whole fountain. It has the mythological figures of Poseidon, Amphitrite, Galatea, and Acis at the base. Interesting picture and interesting composition! What a nice, crisp shot. The air or atmosphere looks so clean and clear...just beautiful! This is interesting. If you didn't post this, I would never have thought fountains could be dismantled for cleaning. I always thought they were just cleaned similarly to swimming pools. Your photos of the fountain are excellent and it is really beautiful. I hope it will be soon back as great as before. Or better. The whole place needs a little cleaning: there is grass between the stones of the ground, the benches would accept some new paintings.. But after all this work, the square will be a beautyful place, among a very interesting architecture. It will be wonderful renovated - hope it won't take too long! A beautiful fountain. Hope it gets up and running soon. Nice to hear this place is being renovated! Hope you can enjoy the fountain again soon. I'm sure you'll show it when its restored to all its glory! Nice general view btw. Keep us posted as the renovation of the fountain progresses. You know I love it when you visit my old neighborhood. Thanks.